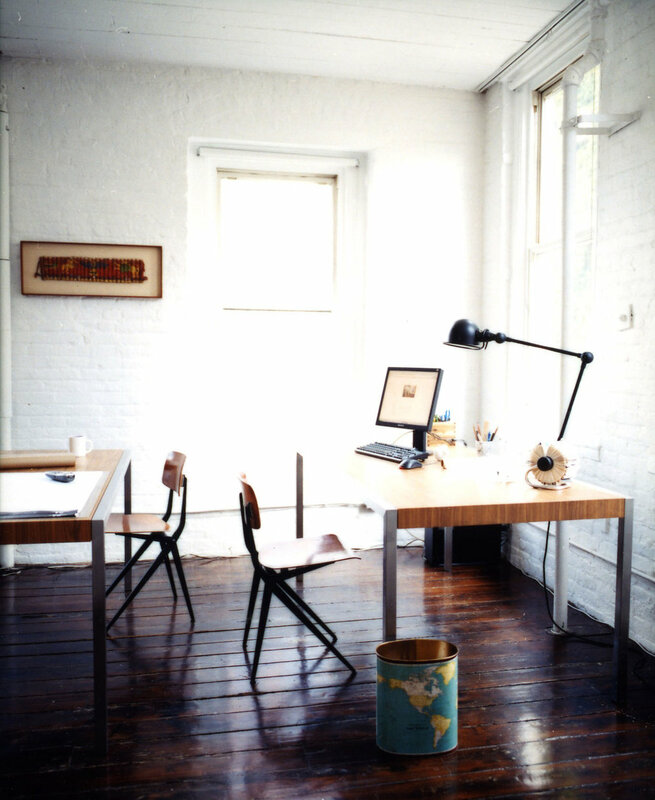 The Greenwich Street loft is a 1,500 SF live / work space located in an old soap and wax factory in the West Village in New York City. The space was left as open as possible, minimal partitions for privacy and alternate layouts were created with simple curtains and sliding hospital track. Wherever possible original finishes were maintained in order to express the industrial history of the space. The loft is entered through two separate entrances. The private entrance is through the living room and opens into the dining and guest sleeping loft. The client entrance is through the kitchen where clients are offered a beverage on their way to a meeting. The rear room is divided into a small bedroom and a more open office area by large, black-out curtains on hospital track mounted to the wood ceiling. The direction of the angled curtains draws clients into the office side of the space and creates a more acute, private corner for the bedroom.